Lets see some re-handled knives! Discussion in 'Edged Tools' started by Sinjin, Mar 16, 2017. I know you guys have made some awesome knife handles! I wanna see them! Medicine maker, CaptCrunch, cek and 34 others like this. Nothing fancy or impressive, but it's quite comfy and functional. Walnut on a green river blade. I put some notches/groves on it to improve grip. I don't have a sheath for it yet so it has only seen kitchen duty, which it excels at! CaptCrunch, Medicine maker, Oakenhart and 27 others like this. I like it! 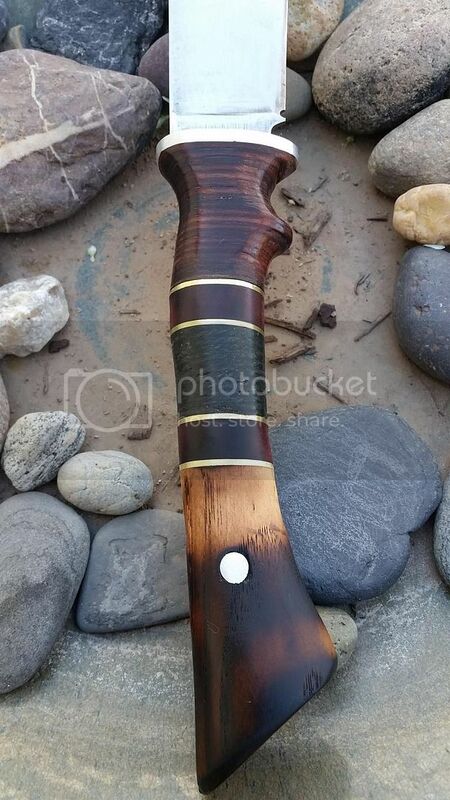 I've always wanted a green river pattern, i might get a blank and re-handle one one of these days, especially while i have a bunch of this spalted birch! Oakenhart, Winterhorse, MrFixIt and 4 others like this. I like it a lot. It came as a kit. I thought about reworking the tang before handling but since it is my only green river I decided to keep its original shape and profile. If I ever get another one I may experiment a little. That splated birch looks great! Great job! Oakenhart, Winterhorse, MrFixIt and 5 others like this. I've done a few re-handled and handled blade blanks. Medicine maker, KFF, Oakenhart and 52 others like this. One of my favorite old hickory mods. KFF, Hungry, Medicine maker and 46 others like this. That is a sweet Hickory mod! I totally dig it, do you mind if I ask what style of Old Hickory it started out as? Thanks! 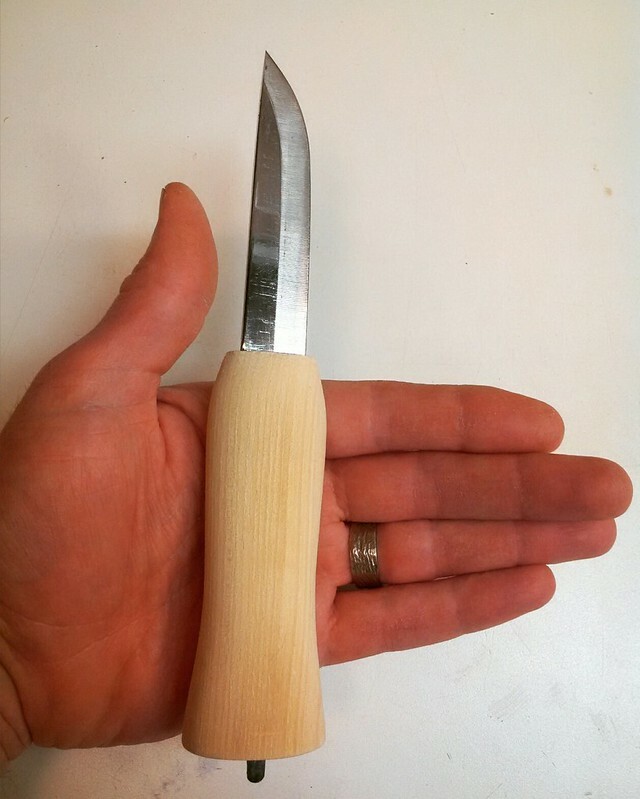 It started out life ad a boning knife that I picked up at a garage sale for less than a buck. 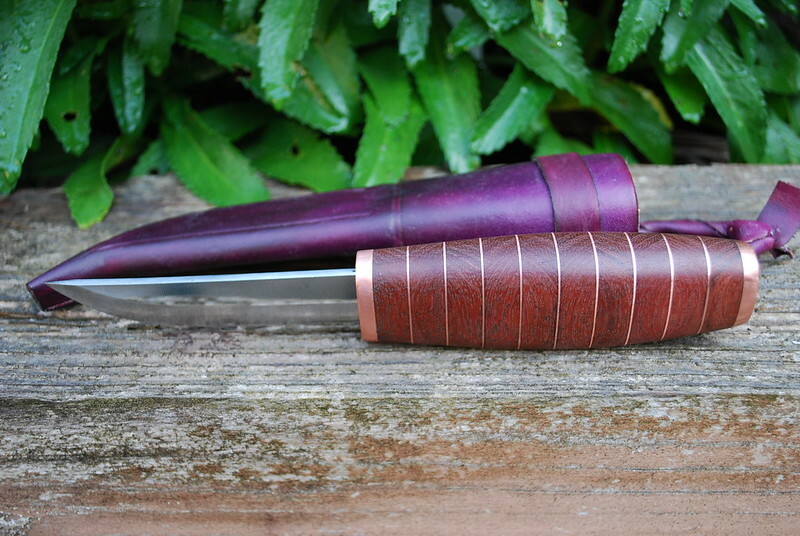 The handles are rosewood with brass pins. Winterhorse, buckfynn, T. Pollock and 3 others like this. Agreed that is a great looking old hickory! I would like to know what original model that is as well if you don't mind. Edit. I saw you posted the model above just before I posted the question. Must of missed it. Oakenhart, Winterhorse, MrFixIt and 3 others like this. Another of my OH mods. 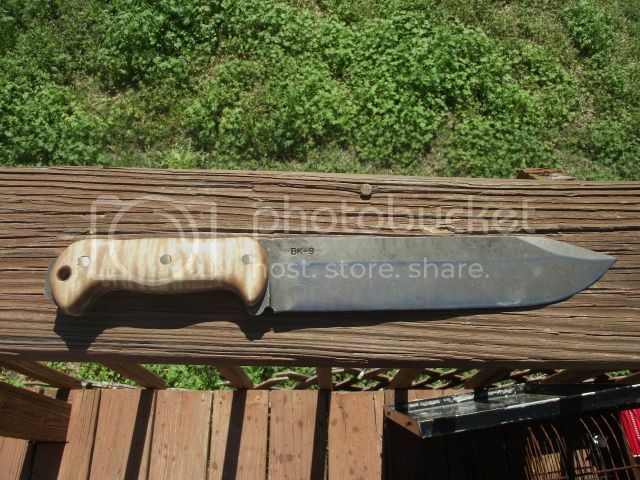 This as a 7 in butcher knife. Medicine maker, Snakeshooter, Oakenhart and 42 others like this. My first self handle. 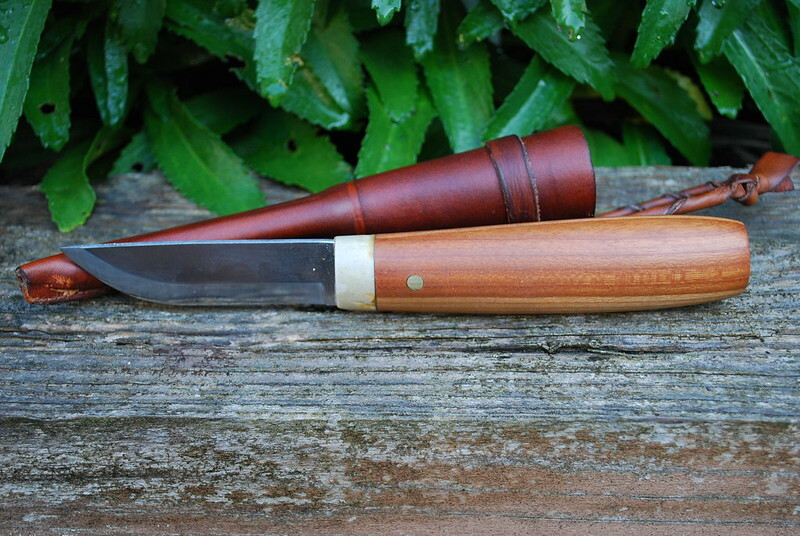 Stacked leather, nickle silver bolster, plastic fiber spacers, and curly birch pommel. Enzo Nordic 95m in O1. Handle shaped like a Kellam Wolverine but larger to fit my hands better. Medicine maker, Oakenhart, Winterhorse and 35 others like this. Medicine maker, KFF, happywanderer and 27 others like this. All these knives are looking great! Its awesome to see how much talent there is on this forum! Oakenhart, Winterhorse, buckfynn and 4 others like this. Winterhorse, buckfynn, Guard and 1 other person like this. That is amazing. Especially since it was your first rehandle job! Winterhorse, buckfynn, backlasher and 3 others like this. Two Green Rivers, a Becker Necker and some Old Hicks. Medicine maker, Oakenhart, CaptCrunch and 31 others like this. Here are a few I've done over the years. This was the very first one, over 30 years ago. Teak. A couple of stripped Izulas wearing elk antler. I am particularly proud of this one. 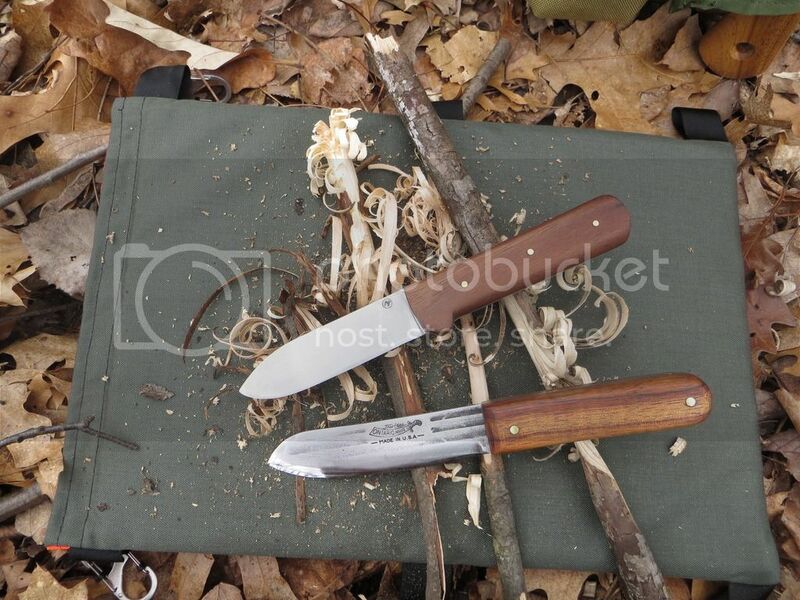 Stripped BK2 and Ironwood. Switched over to Osage Orange. My favorite of all woods. I have more, but that is enough, don't want to bore anyone. I also made all the sheaths. Thanks for looking. KFF, Medicine maker, DustinE and 45 others like this. I'm not bored at all @JohnP ! Winterhorse, Sinjin, Guard and 2 others like this. Winterhorse, Sinjin, backlasher and 4 others like this. 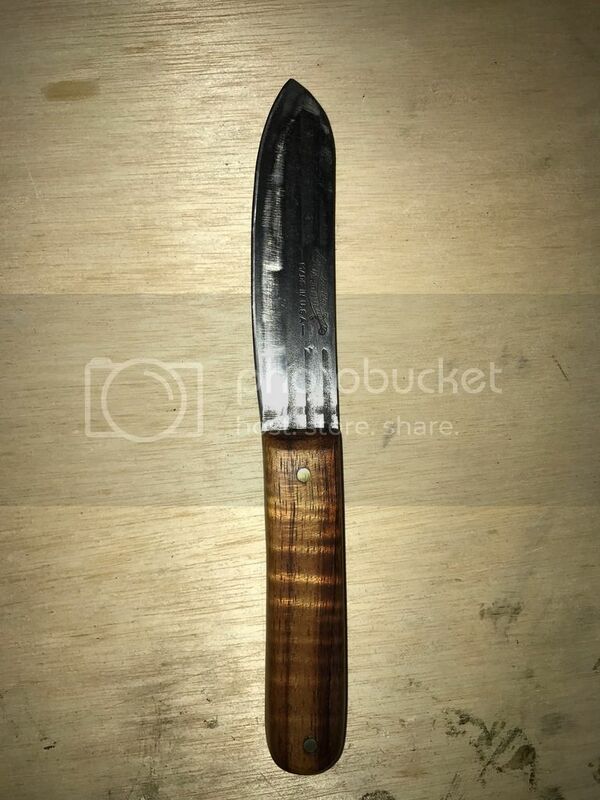 My BIL gave me the teak handled knife when I was in high school. 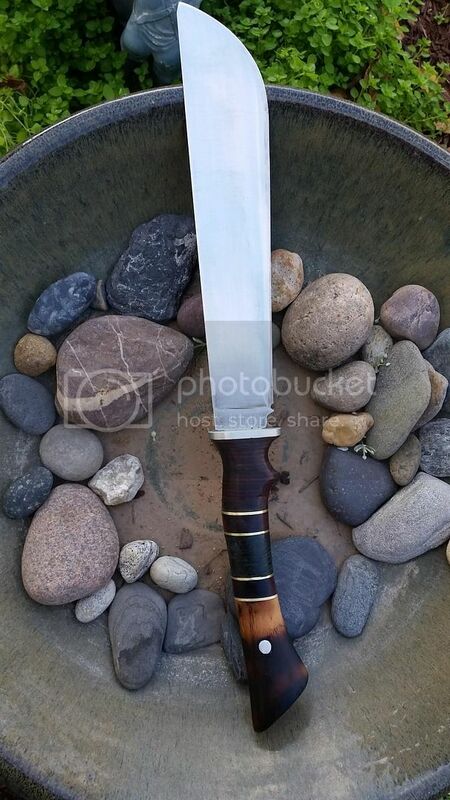 His grandfather forged it from a leaf spring and put a nice antler handle on it. I got married, left it laying on the coffee table and our new puppy chewed the antler off. I was devastated. Absolutely devastated. I moped around for a while, finally went to a fancy wood store and bought a hunk of teak. I had few power tools in those days, most of it was done by hand. It sure 'nuff started me on a life long hobby. Daisy was a dadgum good dog. Winterhorse, Sinjin, backlasher and 7 others like this. Think I'll try some jute wrapped ironwood slabs next, been digging the primitive look! Medicine maker, Oakenhart, Winterhorse and 30 others like this. Persimmon that I had for over 20 years that I stabilized. The wood has worm holes and cracks but is different from anything else I have seen here. Medicine maker, Oakenhart, Winterhorse and 22 others like this. I know nothing about persimmon, but it looks interesting. Did you stain it or is persimmon that dark naturally? Winterhorse, Sinjin and MrFixIt like this. Old Western that was found when a coworkers father passed. Had been beating around in a toolbox for years. Re-handled with jute. Was presented to the coworkers 14 year old son last November for his birthday just before his first deer hunt. Took a great edge too! j_d, Cwlongshot, Medicine maker and 28 others like this. Cwlongshot, MrFixIt and buckfynn like this. It just naturally darkened, plus it is as hard as a rock. Winterhorse, MrFixIt and JohnP like this. JohnP you do some very nice work. MrFixIt and JohnP like this. Winterhorse, MrFixIt and Kinggoat like this. Thank you! 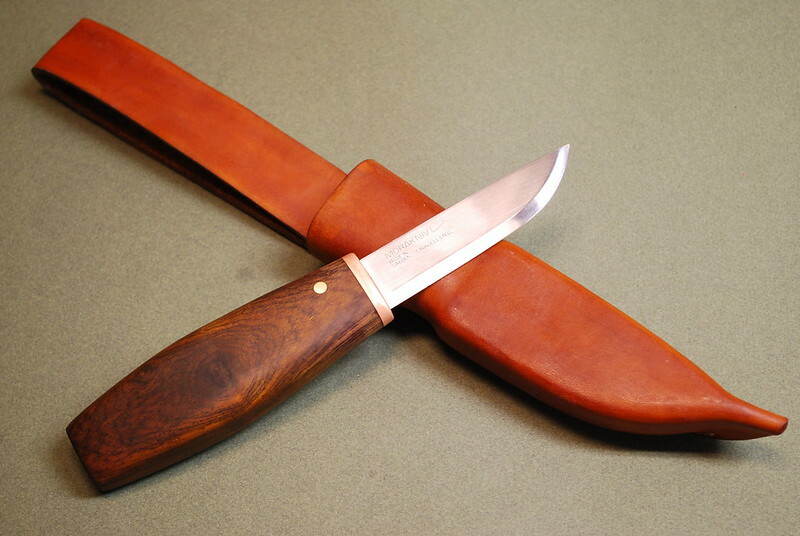 I did another just like this but it was a JC Higgins version of the western knife. Going to try a Buck 102 next. Winterhorse, MrFixIt and buckfynn like this. 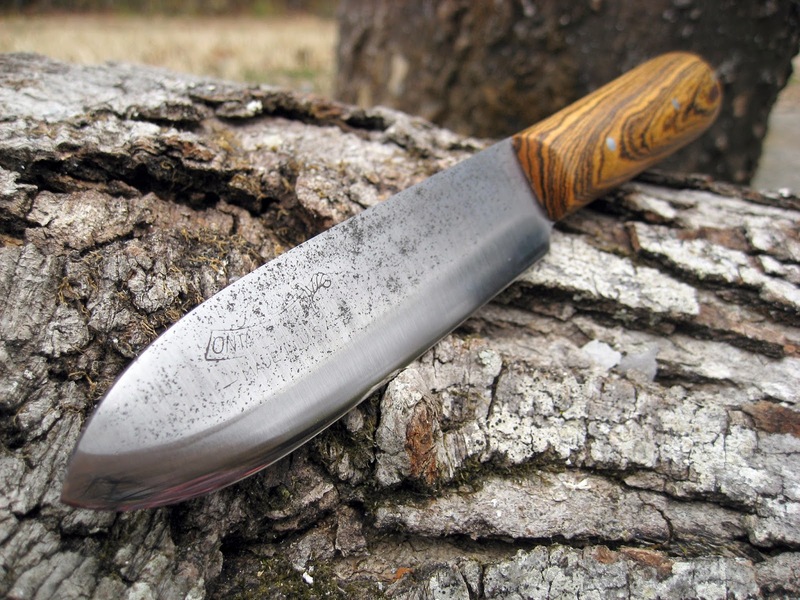 Blade started out life as a 12"-14" Old Hickory Butcher knife. 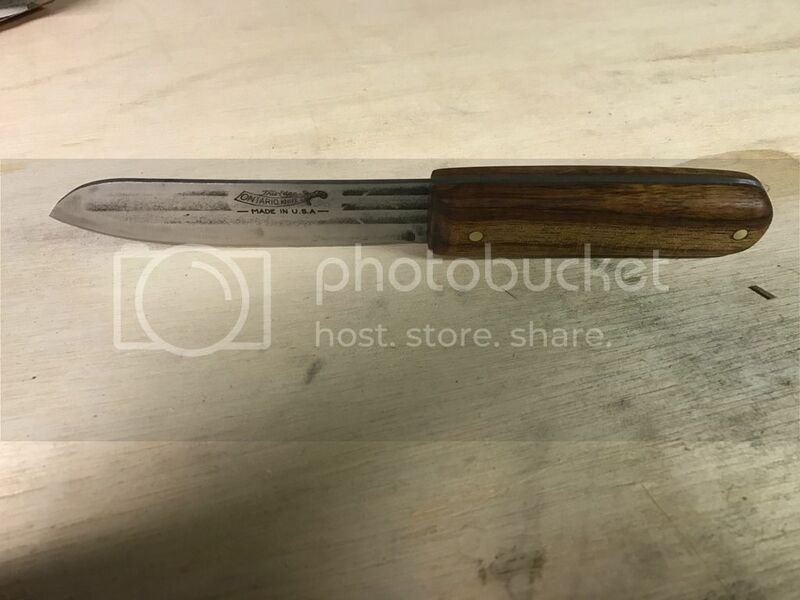 I found (in Junk pile) the SNAPPED in half "Old Hickory" with about 6" of remaining blade. Sent to JKL and this is the results! One of THE sharpest knives I own! 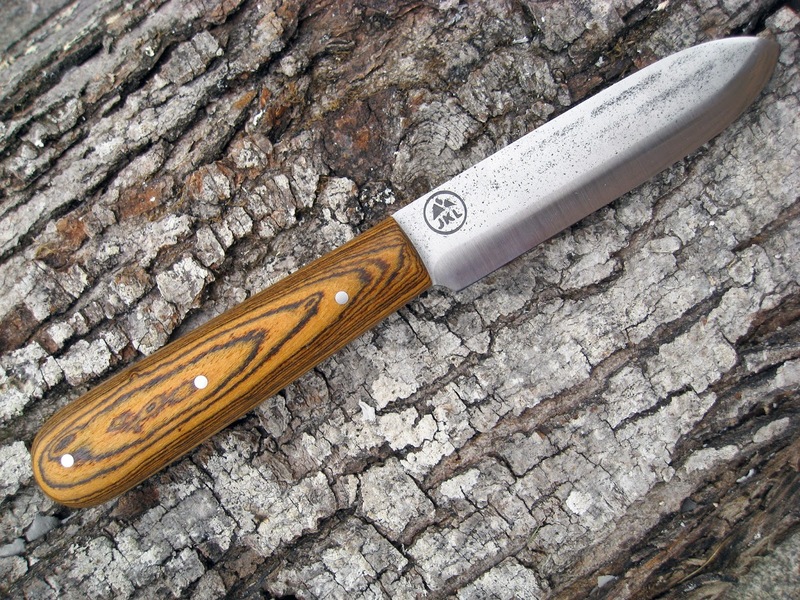 KEPHART style "Old Hickory" with about a 4.5" blade. Sinjin, bigfoots, MrFixIt and 5 others like this. looks real good! totally on par with everything else in this thread dude! I'm with you with the primitive look, I'm thinking of doing something similar. MrFixIt, buckfynn and Angelgutter like this. Here is an Old Hickory that I did my first re-handle. Stabilized Koa. Medicine maker, Oakenhart, Sinjin and 22 others like this. Couple of Old Hick mods. 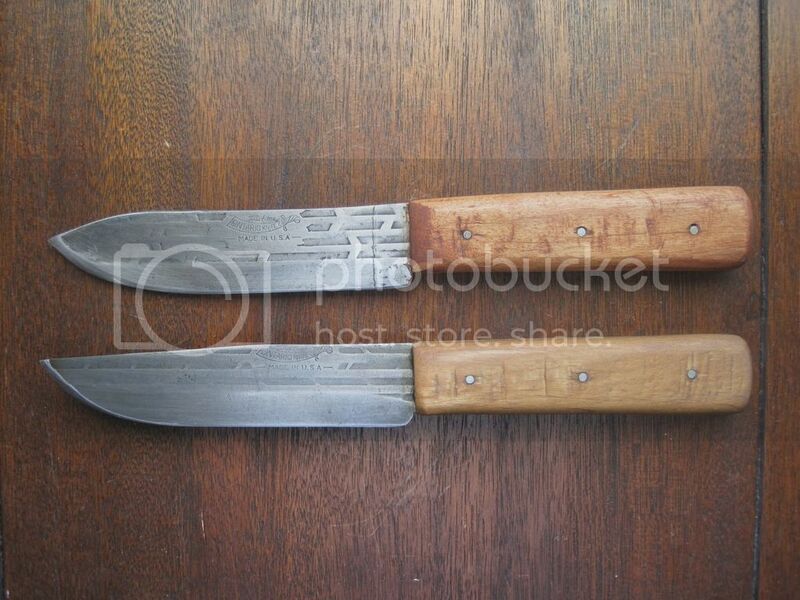 Top one has an alder handle and the bottom one is maple. Pins are 16 penney galvanized nails. Medicine maker, bigfoots, buckfynn and 19 others like this. Medicine maker, Oakenhart, bigfoots and 23 others like this. I'm really digging the OH at 1:00 and the Russell at 7:00! Sinjin, buckfynn, MrFixIt and 2 others like this. A bud, I really appreciate it...got the idea from fiddlebacks rustic wrap. Just scratching an itch until I can get my hands on a Sargent though, id like to see what ya come up with if you give it a shot! MrFixIt, buckfynn, Sinjin and 1 other person like this. Hungry, Rockfarm, notchybynature and 44 others like this. KFF, Oakenhart, americanstrat98 and 22 others like this. I'll definitely let you know what i decide to do, still need to think of what blade shape it should be! KFF, Medicine maker, Oakenhart and 25 others like this. MrFixIt, buckfynn, backlasher and 1 other person like this. BK9 with black burlap micarta. Medicine maker, Oakenhart, Sinjin and 19 others like this. americanstrat98, buckfynn, ExAF1N1 and 3 others like this. The Russell has a thread here. Hungry, Medicine maker, Oakenhart and 17 others like this. Here's an old pic of my BK-9 in curly maple. Medicine maker, Oakenhart, Sinjin and 21 others like this. Modded BK9, green canvas micarta with black & grey fiber spacers. Medicine maker, Gutithej, Broke and 24 others like this. tobiism, buckfynn, ExAF1N1 and 2 others like this. That is without a doubt the sweetest OH mod I've ever seen! The sheath is awesome too. MrFixIt, buckfynn, Guard and 1 other person like this. 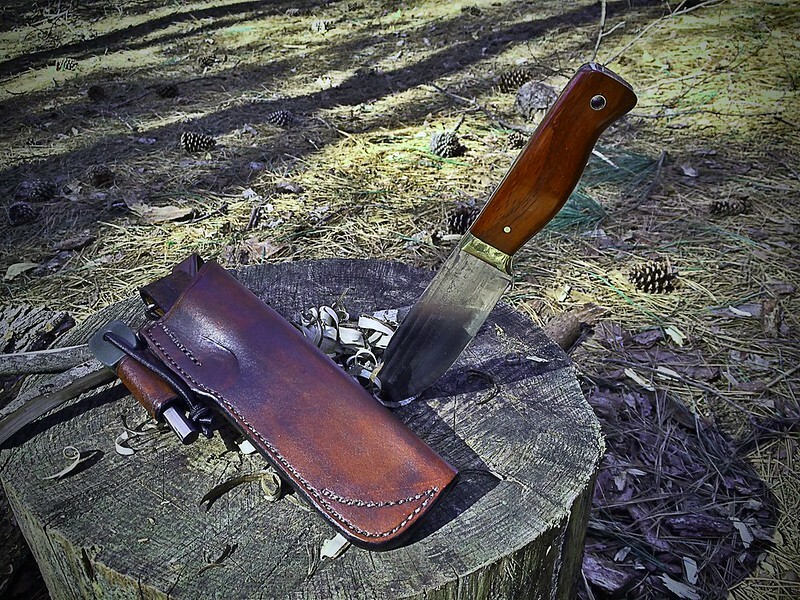 SCHRADE FRONTIER 6" - the single one I liked from all the 1095 family. Medicine maker, Oakenhart, Sinjin and 23 others like this. Medicine maker, Oakenhart, americanstrat98 and 23 others like this.